Disclaimer: i was given the dvd in this post for the purpose of review. I was not paid to write this review. All opinions are my own. My kiddos just adore Peppa Pig. She is silly and makes jumping in puddles look like a blast. Okay jumping in puddles is a blast, but every time we go to our bus stop my boys look for a huge puddle and say look mom we are Peppa and George! I am just waiting for the school to call me and ask why my kiddos show up covered in mud! Peppa and her family are sweet though and promote good values that I want my boys to learn. Which is why Peppa Pig is always welcome in my living room on my TV. Get ready for adventure when “PEPPA PIG: SUN SEA & SNOW” arrives on DVD October 18th from Twentieth Century Fox Home Entertainment and Entertainment One. It’s always perfect weather for Peppa Pigs’s amusing adventures and her loud snorts of laughter, and not even snow, rain, or fog can stop the wintry fun! Join Peppa, her little brother George, Mummy Pig and Daddy Pig as they enjoy a most unusual trip to the seaside, a super ski day, muddy puddle-jumping and more. The whole family can cuddle up together to enjoy all 12 fun-filled ‘Peppasodes’! 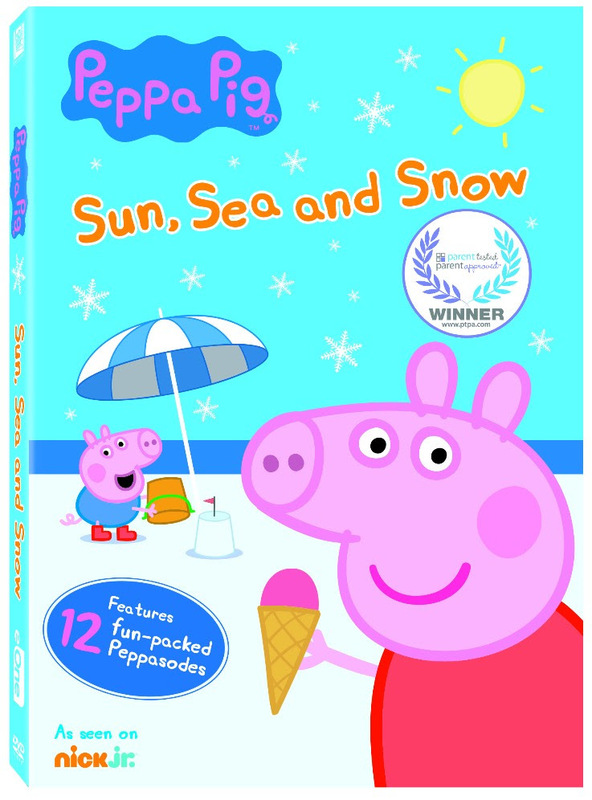 A recipient of the “Parent Tested Parent Approved” seal, the “PEPPA PIG: SUN SEA & SNOW” DVD is guaranteed to delight kids and parents alike during those snuggly colder months.